One man had a smile as big as the sun, one had tears streaming down his face, the third just gritted his teeth. It was the Race of the Falling Leaves, the last Monument of the season and Esteban Chaves (Orica-BikeExchange) let Diego Rosa (Astana) and Rigoberto Uran (Cannondale-Drapac) think it was between the two of them before he came screeching up the left hand side to take the Il Lombardia victory in a three-man sprint. A great finish for the little kangaroo’s great season. There are some days when it’s such a challenge to pick just one rider of the race. And there are some days when it’s a challenge to pick any rider of the race. And then there are days when, regardless of my love for the winner of the race, it’s a no-brainer to give the coveted VeloVoices Rider of the Race to the one who came in second. Yes, my rider of the race is Diego Rosa. The Italian started the race as co-leader with Fabio Aru and proceeded to do a lot of work to keep Aru in the mix but for anyone with eyes it was obvious that Rosa was the stronger of the two – well, stronger than most of the riders in the peloton. With 50km to go, the final decisive splintering of the peloton on the steep Sant-Angelo Abbandonato left a select group, including Rosa, Aru, Chaves, Bedhead Bardet (Ag2r), Quickstepper Gianluca Brambilla – many people’s pick for the win today, mine included – and Uran to name a few. They spent 20km riding cordially with one another until Chaves took the race by the horns and attacked, catching a fatigued group by surprise and getting a gap at the start of the Selvino climb with only Uran and Bardet in tow. Rosa then proceeded to pull Aru up to the climb in a heroic – and selfless – effort, only to have Aru blow, giving him the chance to break free of his co-leader and fight to bridge to the trio at the top of the climb. From there, it was a matter of keeping the chasing group at bay – something the four did handily with a minute in their pocket by the final kilometres. Chaves put in another dig with Uran wise to his tricks but dropping both Bardet and Rosa. Bardet never made it back but once again Rosa dug deep to bridge to the duo and under the flamme rouge they went. It looked, until the last few metres, that it was between Rosa and Uran but Chaves was too wily and took the win from a clearly distraught Rosa. As thrilled as I am for Chaves, the hardwork, the never-say-die attitude and the sheer guts of that ride today makes Diego Rosa my rider of the race. It’s been a very exciting 2016 season and the Monuments definitely played their part, serving up surprises all along the way. 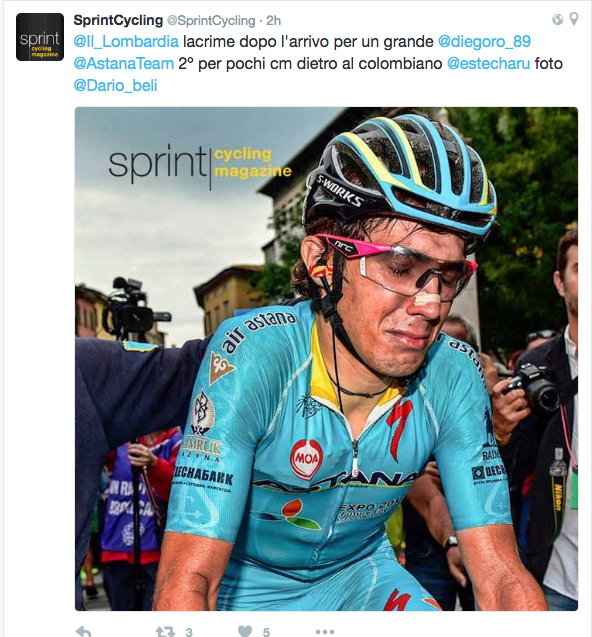 Esteban Chaves not only was a first-time Monument winner, he was the first non-European to win Il Lombardia and the first Colombian to win a Monument ever. Not bad for the little kangaroo and it caps off the brilliant season he’s had this year. We will be seeing a lot more of this rider on the podium in the seasons to come, that’s for sure. Milan-SanRemo was (controversially) won by Arnaud Demare. With Flanders and Roubaix, dominated in the past decade by the soon to be retiring Tom Boonen and Fabian Cancellara, won by Peter Sagan and Mat Hayman; Liege, with Alejandro Valverde and Philippe Gilbert as multiple winners, going to Wout Poels and today’s race, with Gilbert and the possibly-retired, possibly-not Joaquim Rodriguez as former multiple winners, taken by the young Colombian, the torch has been well and truly passed to a younger generation of riders. One of the greatest things about this season is that, except for the Tour de France, it hasn’t felt like one team or handful of riders have dominated the cycling season. We’ve seen young riders brimming with confidence and taking up the fight in every race. We saw new riders win stages in the Giro and the Vuelta, with those GTs on knife-edges up until the last few stages. So thank you to all those riders who have made this season an edge-of-your-seat season to watch.